Founded in 1929 as one of the first radio symphony orchestras in Germany, the Frankfurt Radio Symphony (hr-Sinfonieorchester) has successfully negotiated the delicate balancing act between preserving tradition and meeting the challenges of a modern top-ranking orchestra. Its open-minded artistic profile is defined by series of concerts with highly diverse programmes, in which great symphonic meets music from an earlier time and contemporary music, and numerous projects also for younger audiences. 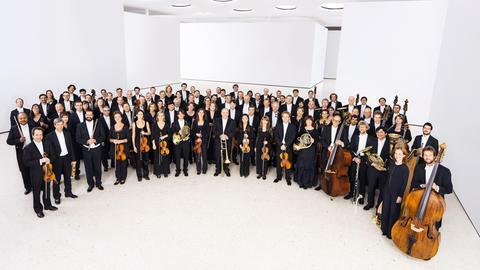 With international guest performances an award-winning CD releases, the symphony orchestra of the Hessischer Rundfunk (German Public Radio of Hesse) has an outstanding reputation worldwide. Regular tours to Asia are as much an integral part of its activities as its continued presence in important concert halls across Europe. Famed for its outstanding wind section, its powerful strings and its culture of dynamic performances, the Frankfurt Radio Symphony now offers a broad spectrum of styles. Together with its Music Director Andrés Orozco-Estrada, the ensemble is associated not only with musical excellence but also with an interesting and varied repertoire. With innovative new concert formats and regular appearances in music capitals such as Vienna, Salzburg, Paris, Madrid, Prague and Warsaw, it underlines its prominent position within the European orchestral landscape. Rising to prominence with its ground-breaking CD recordings, which set new standards in the Romantic and Late Romantic repertoire, the Frankfurt Radio Symphony is considered an internationally leading Mahler and Bruckner orchestra. This musical tradition, initiated by Eliahu Inbal, has shone through under the aegis of Music Directors Dmitri Kitaenko and Hugh Wolff into the musical work of Paavo Järvi, the current Conductor Laureate. From its very inception, the orchestra displayed a firm commitment to both traditional and contemporary music under its first Music Director Hans Rosbaud. Following the war and during reconstruction, the Frankfurt Radio Symphony grew with Kurt Schröder, Winfried Zillig and Otto Matzerath at the helm, finally achieving international standing between the 1960s and 1980s under Dean Dixon and Eliahu Inbal, with guest performances worldwide and the production of multi-award-winning records.